Executing our multi‑business strategy with agility and discipline to capture growth opportunities in sustainable urbanisation. Business was not as usual in 2016. Keppel was hit by the proverbial perfect storm, characterised by slower global growth in both advanced and emerging economies, growing insularism and anti‑globalisation sentiments in developed economies, and volatility in oil prices. Oil prices plunged to below US$30 per barrel at the start of 2016, before rising to about US$55 per barrel in December, in the wake of the decision by OPEC and other oil‑producing countries to cut production. Keppel conducts diversified businesses in more than 20 countries. We are always ready to respond to challenges, just as now, when we face severe headwinds in the offshore and marine business. Despite the rebound in oil price, we do not envisage a quick turnaround in the offshore business, which continues to languish under the weak utilisation and oversupply of rigs. We are anticipating and preparing for a long and difficult winter in the offshore sector. 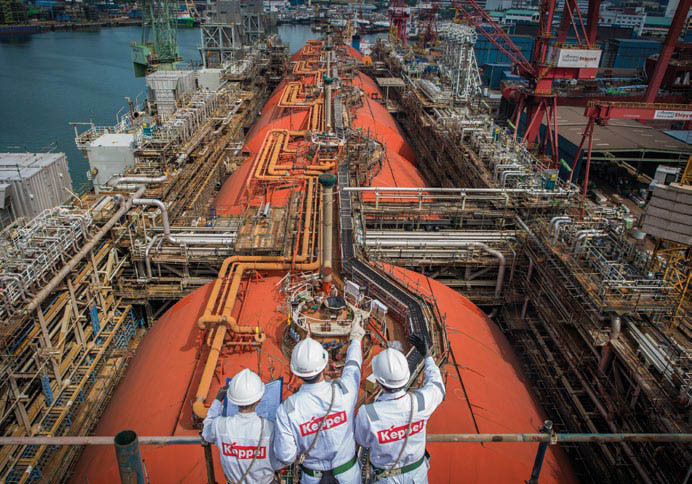 Keppel’s multi-business strategy has kept us resilient amid trying conditions. For the whole of 2016, we achieved a net profit of about $784 million, down 49% from about $1.5 billion for 2015. This was largely due to lower contributions from the Offshore & Marine (O&M) Division as well as additional provisions for impairment during the year of $336 million, mainly arising from our rightsizing of Keppel Offshore & Marine (Keppel O&M) and impairments of investments and stocks & work‑in‑progress. The Group’s Economic Value Added was a negative $140 million for 2016 and our Return on Equity (ROE) was 6.9%. The Board of Directors is proposing a final dividend of 12.0 cents per share. Together with the interim cash dividend of 8.0 cents per share distributed last August, we will be paying out a total cash dividend of 20.0 cents per share to shareholders for the whole of 2016. Keppel has a distinct blend of competencies to provide solutions for sustainable urbanisation. The Group is actively seeking opportunities for growth in this area, through meeting the growing demand for energy, high quality homes and offices, clean urban environments, good infrastructure and digital connectivity. We continue to progress in our goal of transforming Keppel into a global best-in-class company at the forefront of our chosen industries. Over the year, we made several strategic moves to grow Keppel sustainably. We have sharpened our business model and simplified our corporate structure. We are working our capital harder to seek the best possible returns, fostering innovation and collaboration, as well as harnessing synergies across the Group’s businesses. The full ownership of Keppel Land, following the completion of its Selective Capital Reduction exercise, has strengthened our ability to capture opportunities, recycle capital and allocate resources across the Group for optimal returns. 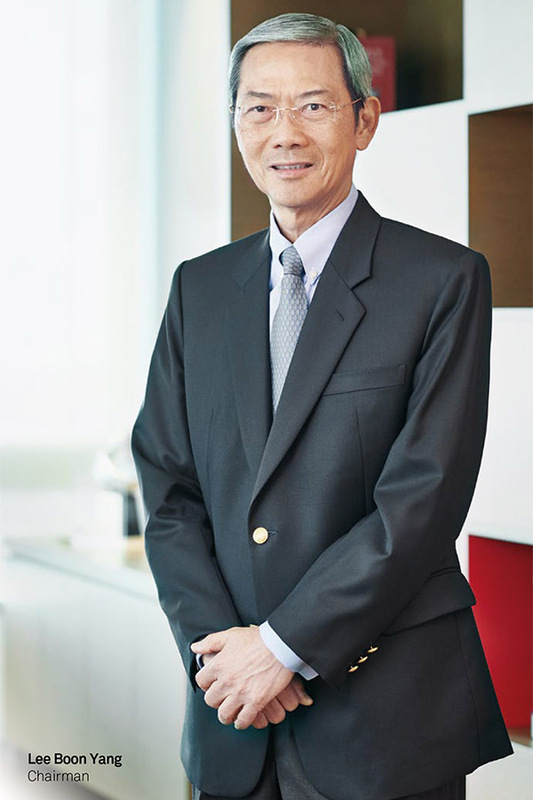 Another major corporate development in 2016 was the completion of the restructuring of the Group’s four asset management businesses, namely Keppel REIT Management, Alpha Investment Partners (Alpha) and Keppel Infrastructure Fund Management, as well as a 50% interest in Keppel DC REIT Management, under Keppel Capital. The creation of Keppel Capital is a significant component in our business model. With total assets under management (AUM) of $25 billion, Keppel Capital will strengthen our capital recycling platform and provide a steady pillar of recurring income for the Group. It will also work closely with the Group’s other business units to expand our capital base with co-investors, thus allowing us to seize opportunities for growth without putting a strain on our balance sheet. We are heartened to see increasing examples of successful collaboration within the Group. For instance, Keppel Land China and Alpha divested their 80% stake in the company which owns the mixed‑use development, Life Hub @ Jinqiao in Shanghai, for US$517 million. The divestment was based on the property’s sale value of RMB 5.5 billion, a significant premium over the original purchase price of RMB 3.3 billion in 2013. Through innovative asset management and enhancement efforts, Keppel Land China and Alpha together contributed to growing a profitable mall with high occupancy and good international retailers. Another product of collaboration, the newly‑launched Alpha Data Centre Fund, demonstrates how we can harness strengths among different business units. Alpha manages the fund and works with Keppel Telecommunications & Transportation (Keppel T&T) to create or acquire assets. Meanwhile, Keppel Data Centres Holding, a 70‑30 joint venture between Keppel T&T and Keppel Land, will develop and project manage the data centres in the fund, as well as serve as the facility manager. Opportunities may also arise in the process to involve our other businesses such as Keppel Infrastructure, for example, to provide cooling and power solutions. When the assets are matured, they can be injected into Keppel DC REIT as part of the deal flow pipeline or sold to other interested buyers. There would also be fees we can earn, which would contribute to the Group’s recurring income. Whether in data centres or other areas of Keppel’s expertise, we will proactively seek more opportunities for Keppel’s diverse units to hunt as a pack along critical value chains. As we grow our businesses in an increasingly complex international operating environment, we continue to strengthen our compliance and control processes to ensure that our people, Keppelites as we fondly call ourselves, are well equipped to navigate the challenges of myriad laws and regulations in different jurisdictions. We have put in place a new framework to operationalise regulatory compliance and foster an effective compliance culture. The framework deals comprehensively with the structure, people, policies and activities required to identify, assess, monitor and manage compliance risks. We have taken decisive measures to hunker down in the face of strong headwinds facing Keppel O&M, not just to survive a long winter, but also ensure that we are competitive in the long run and entrench our leadership position in the global offshore and marine industry. For the whole of 2016, Keppel O&M reduced its direct workforce by about 10,600 or 35%, with about 3,800 in Singapore and 6,800 overseas. Subcontract headcount in Singapore was also lowered significantly. In tandem, we are cutting our yard capacity and have mothballed two overseas yards. In Singapore, we are in the process of closing three yards. The collective measures taken by Keppel O&M have reduced overheads significantly, achieving savings of some $150 million year‑on‑year. The painful but necessary rightsizing efforts at Keppel O&M will have to continue. Despite the challenging environment, the O&M Division remained profitable for the full year, and clinched new contracts worth about $500 million. Our yards continued to focus on executing projects well, delivering more than 20 projects, including four jackup rigs, an accommodation semisubmersible, a land rig, several Floating Production Storage and Offloading conversion and fabrication jobs, as well as several specialised vessels during the year. In 2017, some 20 newbuild and conversion projects are slated for delivery including the world’s first‑of‑its‑type floating liquefaction vessel conversion, Golar Hilli. Beyond dealing with immediate challenges, Keppel O&M is exploring new markets and opportunities, investing prudently in R&D and building new capabilities in preparation for the upturn. We are also exploring ways to re‑purpose the technology that we have developed for the offshore industry for other uses. Following the completion of the acquisition of Cameron’s offshore product division, we have commenced the operations of Keppel LeTourneau since May 2016, with offices in the United States, United Arab Emirates and Singapore. The acquisition complements Keppel O&M’s existing competencies, and enables us to expand our business in the provision of aftersales and aftermarket services. Keppel O&M’s extensive and proprietary suite of offshore and marine solutions is able to serve a wide spectrum of customers in both drilling and non‑drilling markets, who continue to require various solutions, be it for oil production, offshore liquefaction, or other purposes. Keppel is well positioned to capture opportunities across the value chain in the growing gas market. Keppel O&M has established a 50-50 joint venture with Shell to supply LNG bunkering services in Singapore’s port. More recently, we have secured orders for our first two dual-fuel diesel LNG tugs, which will be built to Keppel’s award-winning proprietary design. As for the ongoing investigations in Brazil, following further internal investigations, Keppel recognised that some transactions involving a former agent of certain Keppel entities in Brazil may be suspicious. Keppel has notified the authorities in the relevant jurisdictions of its intention to cooperate and work towards the resolution of the underlying issues arising from or in connection with the transactions. I want to assure all stakeholders that Keppel has a zero‑tolerance stance against any form of illegal activity, including bribery and corruption, involving its employees or associates. Golar Hilli, the world’s first‑of‑its‑type floating liquefaction vessel conversion, will be completed in 2017 for work in Cameroon. Rapid urbanisation across key Asian cities augurs well for our Property Division as it achieved stronger residential sales in 2016. About 5,720 homes were sold in 2016, with a total sales value of about $2.3 billion. This is about 25% higher than the 4,570 homes sold in 2015. In China, despite the property market cooling measures in selected cities, we sold about 3,800 units, approximately 16% more than in 2015. Market conditions in Vietnam, especially Ho Chi Minh City, have also been favourable, where we sold 1,520 units, a more than 60% increase year‑on‑year. Despite the tepid property market in Singapore, we sold 380 homes, double the 190 units in 2015. We are very focused on achieving a high ROE for Keppel Land and to remain a developer with one of the highest ROEs in Asia. Throughout 2016, the Division proactively recycled assets to achieve higher returns, announcing 11 divestments totalling about $680 million. At the same time, Keppel Land also seized opportunities proactively, investing about $460 million across China, Vietnam and Indonesia. On the commercial front, Keppel Land has over a million square metres of gross floor area under development. In line with the strategy to strengthen our commercial portfolio, we purchased a stake in I12 Katong retail centre in Singapore, as well as a newly‑completed retail development in the Jiading District of Shanghai. We also opened the Saigon Centre retail mall, anchored by Takashimaya Department Store, in Ho Chi Minh City. Our suite of Grade A office buildings in key cities was augmented with the completion of International Financial Centre Jakarta Tower Two and the topping off of Junction City Tower in Yangon. We are also expanding our collaboration with the Shwe Taung Group, a reputable conglomerate in Myanmar, in Junction City Phase 2. 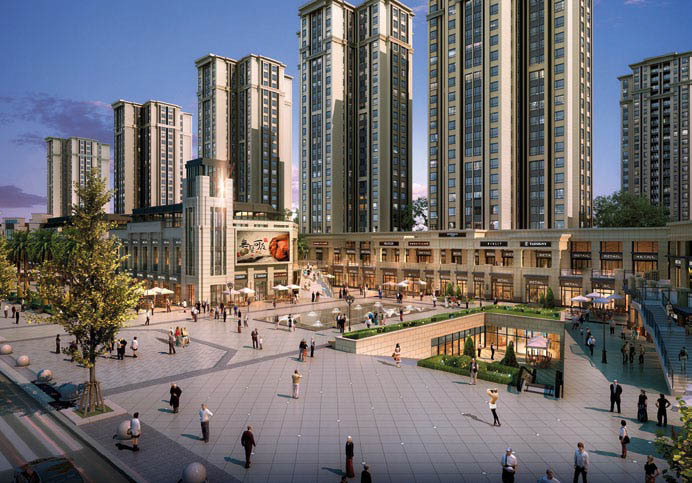 Keppel Land continues to see strong interest in its projects in focus cities in China, such as V City in Chengdu. Keppel Infrastructure continues to pursue growth opportunities in energy and environmental infrastructure, both in Singapore and overseas. We concluded 2016 with the good news that Keppel Infrastructure will Design, Build, Own and Operate Singapore’s fourth desalination plant with a concession period of 25 years. To be operational in 2020, it will be the first in Singapore with the capability to treat sea water, and also fresh water from the Marina Reservoir, by using reverse osmosis and other advanced membrane technology. In China, Keppel Seghers, a wholly‑owned subsidiary of Keppel Infrastructure, continued to reinforce its position as the leader among imported waste‑to‑energy (WTE) technology solutions providers in the country. Keppel Seghers secured six contracts to provide WTE technology and services, including that from repeat customer Shenzhen Energy Environment Engineering Co for the Baoan WTE plant, which is slated to become the world’s largest WTE facility in terms of incineration capacity. Over in Qatar, we have completed the handover and commenced the operations and maintenance phase for the solids stream and sludge treatment facilities in the Doha North Sewage Treatment Works. The 10‑year operations and maintenance phase of the contract will contribute to stable income streams for the Group. Meanwhile, Keppel Infrastructure is preparing competitive products and services to be ready for the full liberalisation of Singapore’s electricity market expected in 2018. Our data centre business is tapping the mega trends of data traffic, cloud computing and big data to grow rapidly. Seizing opportunities over the year, our Group’s data centre business increased its footprint by more than 45%, in terms of net lettable area, in markets such as Hong Kong, Italy, the UK and Germany. During the year, we broke ground for Keppel DC Singapore 4, the fourth data centre in Singapore under Keppel Data Centres. Keppel Data Centres has also divested 90% of its stake in Keppel DC Singapore 3 to Keppel DC REIT, allowing the company to recycle its capital. In line with the evolving urban logistics landscape, Keppel Logistics is developing capabilities in omni‑channel distribution. The acquisition by Keppel Logistics of e‑commerce fulfilment company, Courex, strengthens our ability to tap opportunities in the growing e‑commerce sector. Meanwhile, our distribution centre in the Sino‑Singapore Tianjin Eco‑City has begun operations and will cater to the growing market in Northern China. Our asset management businesses are contributing to the Group’s capital recycling strategy and providing stable income streams over the longer term. Alpha, now under Keppel Capital, launched the Alpha Data Centre Fund and Alpha Asia Macro Trends Fund III which have a combined target size of US$1.5 billion. The two new funds have since made their first acquisitions, and when fully invested, can add as much as US$3.5 billion to Keppel’s total AUM. Keppel DC REIT’s AUM increased to approximately $1.4 billion with 13 data centres, three of which were added to its portfolio in 2016. KrisEnergy’s preferential offering of the zero coupon secured notes with free in‑the‑money detachable warrants was fully subscribed by its shareholders. The long‑term fundamentals of the oil and gas industry remain sound and we are hopeful that we can extract good returns from our investment in KrisEnergy when the market improves. The successful Consent Solicitation Exercise to term out two existing notes, and issuance of the zero coupon secured notes would allow KrisEnergy to ride out the volatility in the oil price. Keppel leads the Singapore Consortium in the Sino‑Singapore Tianjin Eco‑City, which has now completed its eighth year of development. 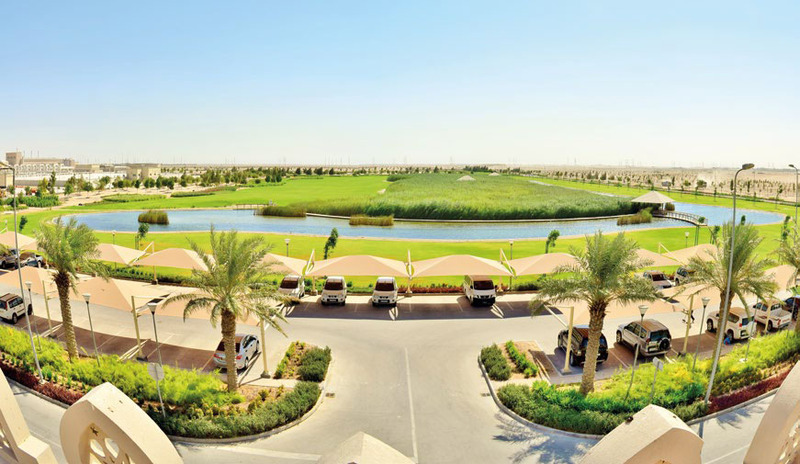 As the Eco‑City matures, we are drawing keen interest from developers and home buyers. In 2016, more than 6,300 homes were sold in the Sino‑Singapore Tianjin Eco‑City. Reflecting the market’s growing confidence in the sustainable township, the price of land sold in the Eco‑City has also been rising steadily. Keppel upholds sustainability as a key pillar of our corporate strategy and operations, so as to create enduring value for all our stakeholders. We are heartened that our sustainability efforts have been recognised both in Singapore and abroad. Keppel Corporation was bestowed a Singapore Apex Corporate Sustainability Award 2016 in the Sustainable Business category (Large Organisation). Keppel has been included in the Dow Jones Sustainability Index for four consecutive years, and is also listed on a number of other sustainability indices, including the MSCI Global Sustainability Index, Euronext Vigeo Eiris Index – World 120 and all four sustainability indices launched by the Singapore Exchange in 2016. We also participated in the CDP (formerly Carbon Disclosure Project). Even as we hunker down, we continue to invest in the development and training of our people. To allow Keppelites to explore, develop and fulfil their professional aspirations within the Group, we are working towards harmonising our human resources policies to facilitate greater mobility of staff across different businesses and geographies. We also recognise the valuable contributions made by earlier generations. In November 2016, Keppel Fellows, an alumni comprising former board members of Keppel entities and selected members of senior management, was established to better engage distinguished former Keppelites and tap their valuable ideas and experience. Safety remains our top priority. With 35 awards under its belt, Keppel was the single largest winner at the 2016 Workplace Safety and Health Awards, organised by the Workplace Safety and Health Council and Ministry of Manpower, Singapore. In spite of our best efforts, however, we suffered seven fatalities across the Group in 2016. We are deeply saddened by the loss of our colleagues. We have investigated these incidents and will further strengthen our efforts in our safety journey to ensure that every Keppelite can go home safe, every day. Our commitment to sustainability extends to the communities where we operate, and the environment. We are happy to contribute to enhance Singapore’s biodiversity with the commitment of more than $2 million to establish the Keppel Discovery Wetlands. This is a partnership with the Singapore National Parks Board to restore the freshwater forest wetland ecosystem historically found in the vicinity of the Singapore Botanic Gardens, a UNESCO World Heritage site. The 1.8‑hectare forest wetlands will enhance the biodiversity found in the region and provide valuable educational opportunities for the public. Keppel supports Qatar’s vision for sustainable development with the Doha North Sewage Treatment Works. Since its opening in October 2015, the Keppel Centre for Art Education at the National Gallery Singapore has drawn more than 300,000 visitors to discover art through imaginative play. Guided school tours and workshops introduce visual literacy, analytical and interpretive skills to students and supported Singapore’s national curriculum. The first of its kind in the region, the Centre was established with a $12 million commitment from Keppel. Keppelites are also committed to make a difference in the community through volunteerism. In 2016, Keppel Volunteers engaged with and cared for beneficiaries, supported by Keppel Care Foundation, with more than 8,000 hours in service. Overseas chapters of Keppel Volunteers were also established in the Philippines, China, Vietnam and Brazil. To communicate our sustainability strategy, practices and performance, Keppel Corporation produces an annual sustainability report which draws on internationally‑recognised standards of reporting, including the Global Reporting Initiative. We will be publishing Keppel Corporation’s seventh sustainability report, which discusses the economic, environmental and social aspects of our activities and initiatives, later this year. The report will be in line with the new requirements on sustainability reporting introduced by the Singapore Exchange and will be externally assured in adherence to the AccountAbility AA1000 Assurance Standard (2008). Brief highlights of our sustainability efforts are also outlined in this Annual Report. 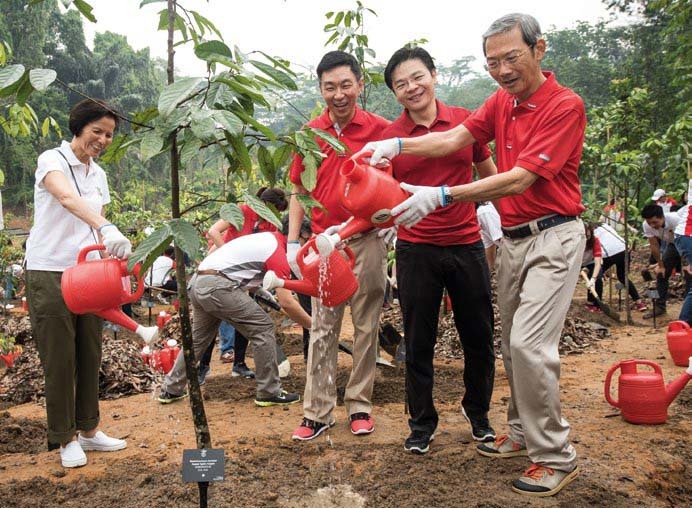 Mr Lawrence Wong (second from right), Minister for National Development and Second Minister for Finance; Dr Lee Boon Yang (far right), Chairman of Keppel Corporation; Mr Loh Chin Hua (third from right), CEO of Keppel Corporation; and Mrs Christina Ong (left), Chairman of NParks, planted a Keppel Tree at the Keppel Discovery Wetlands in Singapore Botanic Gardens. On behalf of the Board, I would like to express my deepest appreciation to Mrs Oon Kum Loon, who retired from the Board in end‑April 2016 after 12 years of dedicated and outstanding service. Prior to her retirement, she was Chairman of the Board Risk Committee, as well as a member of the Audit Committee and Remuneration Committee. Reflecting solidarity in these troubled times, senior management across the Keppel Group took a voluntary reduction in their monthly salary in 2016. The Directors of Keppel Corporation are also proposing to lower Directors’ fees for 2016. While Keppel remains profitable, the voluntary cuts by Directors and senior management demonstrate our collective resolve to deal with the challenges that the Company faces. I would like to thank my fellow directors for their valuable guidance and commitment to steer Keppel through these difficult times. I am grateful to our many partners and stakeholders for their unflagging belief in and support for Keppel. I also want to express my deep appreciation to Keppelites around the world for their dedication and hard work in the face of daunting challenges. With the support and confidence of all our stakeholders, I am convinced that the Keppel Group will emerge even stronger after the downturn, as we have done before.